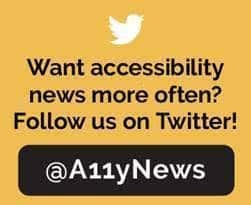 Accessibility in the News — 3/8/19. A disabled woman faced several “physical barriers” when attending a concert at a winery in Washington, and after a settlement with the American With Disabilities Act (ADA), the venue has agreed to make changes to its tasting room and amphitheater. U.S. Attorney Brian Moran explained the details of the settlement in a news release from the U.S. Attorney’s Office for Western Washington. The woman, Char Blankenship, had reached out to him after her experience at Chateau Ste. Michelle in Woodinville. Jack Fact — According to the National Organization on Disability’s 2018 assessment of nearly 200 companies, only 49 percent reported that their recruiting websites and intranets were compliant with the Web Content Accessibility Guidelines (WCAG) by the World Wide Web Consortium, as recommended by most courts. What does Edmonton accessibility look like to you?